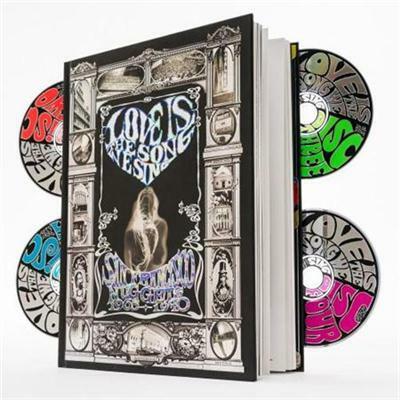 VA - Love Is the Song We Sing San Francisco Nuggets 19651970 (4 CDs Box Set) (2007) | Free eBooks Download - EBOOKEE! Posted on 2014-04-13, by supnatural. Disc 1, -Seismic Rumbles,- maps the divergent fault lines separating the tradition pop flavors of the early 1960s from San Francisco's emerging bands that were inspired by the more complex rock and roll of The Beatles and Bob Dylan. Highlights include -Can't Come Down- from Dead precursors The Warlocks, the demo for Quicksilver Messenger Service's -Who Do You Love,- the earliest incarnation of the Airplane on -It's No Secret,- -I Feel Like I'm Fixin' To Die Rag- from Country Joe & The Fish and -Mr. Jones (A Ballad Of A Thin Man)- from a prehistoric Grass Roots ensemble. Disc 4, -The Man Can't Bust Our Music,- charts the visionary artistry and mind-blowing evolution of the maturing San Francisco sound - an epic musical wellspring that changed the course of rock and roll and gave birth to freeform FM radio. Stand-out tracks, among the greatest in 20th century rock, include Santana's -Evil Ways,- Janis' -Mercedes Benz,- -White Bird- from It's A Beautiful Day and the Dead's -Dark Star-. No comments for "VA - Love Is the Song We Sing San Francisco Nuggets 19651970 (4 CDs Box Set) (2007)".